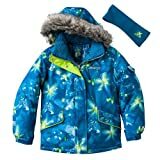 ZeroXposur Teal Gem ZX-360 Girls Snowboard Jacket – XL (16) – SkiChild – Snow Skiing and Waterski for Kids. Ski Product Deals, Reviews, Travel Deals and more. ZeroXposur fuses art with technical design to construct apparel and accessories that define the extreme sports lifestyle. Each product is crafted with a detailed focus on individual components and features. ZeroXposur pushes the limits of creativity with every product, from inner design to outer shell styling. ZeroXposur creates with your individuality in mind.